Some think, some do – some eat cake! Each month the IQ Group team comes together to share knowledge and acknowledge achievements. This time together is always a great opportunity for us to find out more about the wealth management industry and what IQ Group is doing to help our clients create the best possible future. This month, we have also taken this opportunity to come together to raise money (and eat cake) for a worthwhile cause…the RSPCA. Providing services to reunite lost pets with their owners. The RSPCA is principally funded from donations and every bit of help they get is desperately needed as they receive very little government support. 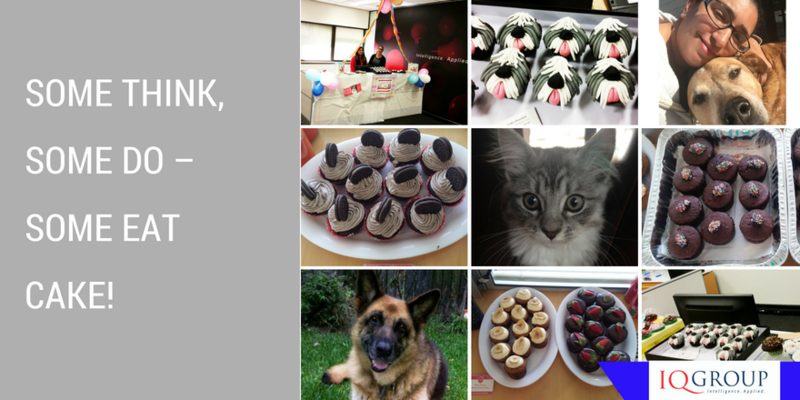 RSPCA Cupcake Day is just one way we can help. This year the RSPCA received 133,495 animals in animal shelters and adoption centres across the country. Over the past 10 years RSPCA have adopted out, reunited with their owners and released into the wild 711,117 animals. IQ Group joined in digital workspace across the eastern states to raise money for this great cause. The sugar high lasted for a few hours and together we raised over $400.00. Regina’s puppy dog cakes were the clear winners in Sydney while Brisbane enjoyed home baked goodness from Amanda. The Melbourne team couldn’t pick a winner with so many great cakes to enjoy. Next year we plan on keeping our commitment to the RSPCA and will eat even more cake to help create the best possible future for our furry and feathered friends, for all creatures great and small. We will keep you posted. 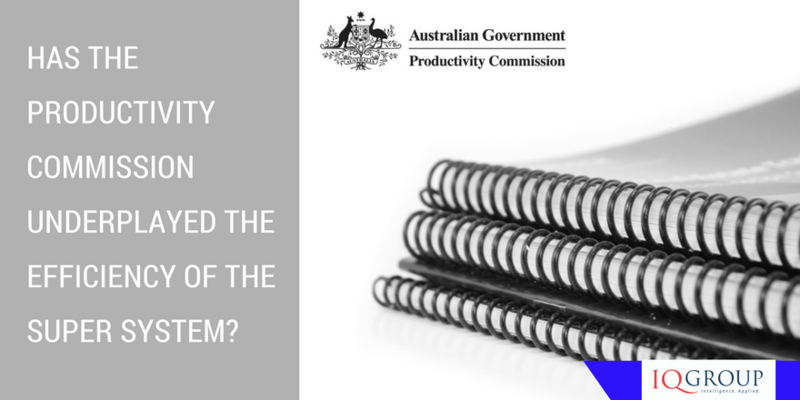 Has the Productivity Commission underplayed the importance of cost efficiency in superannuation? In its draft report about assessing the competitiveness and efficiency of the super system, the Productivity Commission has proposed over 100 indicators, and in so doing, has underplayed the importance of improving the overall administrative and operational efficiency of the system. When the Productivity Commission was asked by the Government to develop criteria to assess the efficiency and competitiveness of the superannuation system, the scope of their study was to specifically include operational efficiency – delivering products and services in a way that minimises costs and maximises value. Despite this, the role of cost minimisation in improving operational and administrative efficiencies has taken a back seat. Where cost minimisation is mentioned, it is often harnessed in support of an argument for harvesting great scale efficiencies. This is despite the correlation between scale and efficiency not being as strong historically as it should be. Identifying evidence-based indicators to facilitate the assessment. The report proposes system-level objectives, identifies questions to be asked and answered, and across both competition and efficiency suggests 27 criteria and 115 indicators to be used in the framework. 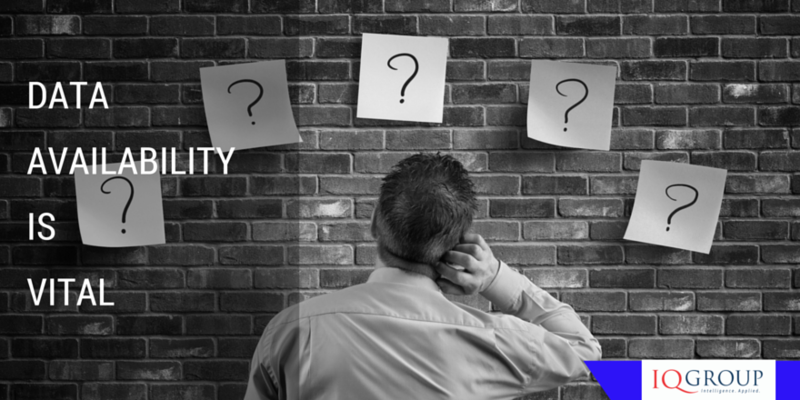 While this may be the function of a work in progress, this large number of indicators and criteria runs the risk of not being appropriately weighted, prioritised and categorised – and having collected data from so many sources, the absence of some data becomes even more problematic. While the Productivity Commission may be expecting much of this information to come from existing data sources, new surveys and sources of data will need to be established for the collection of the necessary data. The irony is that the weight of this administrative burden is likely to be heavy, costly and time-consuming, and quite at odds with the recommendations of the Financial System Inquiry – and the philosophy of the present Government – to reduce the regulatory burden. While there is a heavy emphasis on the importance of funds collecting information on their individual members and using it to design products that better meets specific member needs, the report is light on about topics such as data management, innovation and new technologies. SuperStream rates a mention, and even its own indicator, but other issues such as the impact of new payment systems are not mentioned. The draft objective about maximising net returns in the long term includes a criteria asking if costs incurred by funds are being minimised, taking into account service features provided to members, and lists a few indicators of this (eg, cost savings from SuperStream) but this is dwarfed by the bulk of other criteria and indicators. Cost minimisation is a major contributor to return maximisation – and not just in the context of scale – and should be recognised as such. This doesn’t mean that we need to have a dozen explicit operational efficiency indicators and benchmark. There would be significant costs associated with that approach, not least of which would be the additional reporting requirements imposed on funds. Far better to identify simply identify cost minimisation (along with return maximisation, good governance and quality member services) as a non-prescriptive factor to be taken into account in determining the efficiency of a fund. In June this year Australia’s bitcoin users were provided with a greater variety of cryptocurrency options with users now able to buy ether, the digital currency which the Ethereum network relies on. As these bitcoin exchanges CoinTree and CoinLoft have rolled out a strategy which focuses on making bitcoin more attractive for the general public, there are more currency options available. For example CoinTree users can now swap bitcoin for popular altcoins such as ether, litecoin and DAO tokens. CoinLoft users that are making deposits can now purchase bitcoin and ether too. This is mainly because the launch of Ethereum’s smart contract technology in Australia has seen it make a large impact in a short period of time. This move towards the populist use of cryptocurrency is in line with the recent findings of an industry report and industry feedback from a global Blockchain conference. The Evolution of the Bitcoin Economy: Extracting and Analyzing the Network of Payment Relationships is a joint study from Paolo Tasca of the University College London, Shaowen Liu from Deutsche Bundesbank and Adam S. of University of Wisconsin-Madison and it tracks the bitcoin economy growth. The report has distilled 2850 of super cluster users to highlight who is using bitcoin and what for. It looked into the particular economic purpose of bitcoin and the exchanges between these super users to track crypto trends. It identified three ‘distinguishable regimes that have existed over the lifespan of the Bitcoin economy’. It’s interesting to track these phases and see where we are at now. The first phase they have described as ‘proof-of-concept’ and it was based on ‘mining with little substantive economic activity’. The second phase is courtesy of rapid growth – with early adopters such as gambling services and black markets (think Silk Road) who rely on the unique attributes that a cryptocurrency provides. And the final phase is where these first enterprises are replaced by legitimate merchants that are active with exchanges converting digital currency – the maturation phase. Their summary of the Bitcoin economy is it has grown, matured and has distinct patterns of behaviour amongst influential entities and participants. Criminal activities may have been overstated and these are expected to decrease further as the maturation phase deepens further. The take up of blockchain and bitcoin will continue to deepen further and possibly more quickly than anyone is realising. 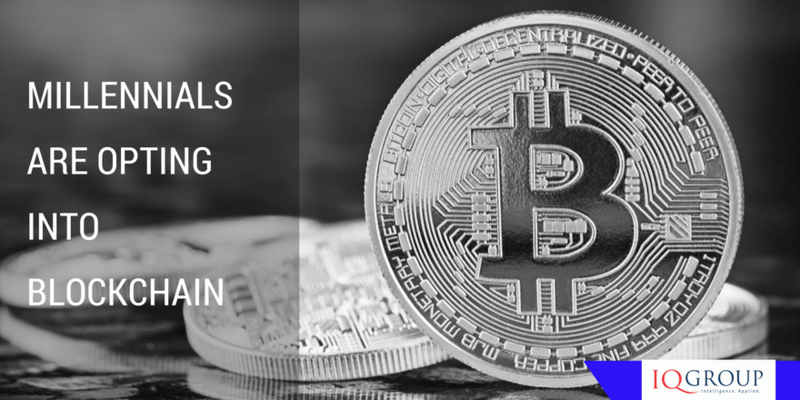 In August the Blockchains + Digital Currencies Conference was held in New York and the conference covered a broad range of topics, with particular attention to how important the blockchain is for global banking. Blockchain technology has the ability to ‘speed up the flow of money globally and make business processes more efficient and transparent’ from an official perspective. However from the everyday perspective we were reminded ‘many Millennials are opting out of the traditional banking system’ and don’t even have an interest in a credit card – it’s all about the smartphone. For these end users the traditional banking process is obsolete. Even with banks trying to catch up in mobile banking, it’s still too slow. This was highlighted by Eileen Lowry Program Director, IBM Blockchain Offerings, who tweeted: 10% of global GDP will be stored in a blockchain by 2027. The next phase of how Australia reacts to and adopts blockchain technologies and cryptocurrency will certainly be interesting. The way in which superannuation information is reported to and from government agencies, and how it is published and can be used by consumers and researchers is vitally important to super funds. It impacts on how people make decisions about their super, including switching and consolidating accounts, and how competitive and efficient the system is as a whole. At a detail level, discussion about the Superstream data standard, the Member information eXchange (MiX) and the Data Dissemination Tool (DDT) may only have niche interest and only excite the geeks amongst us – myself included! But at a high and strategic level, the use of this data will help determine the future of superannuation and of individual super funds. That’s why it’s interesting the Government is implementing a Financial System Inquiry recommendation by asking the Productivity Commission to undertake an inquiry into data availability and use in the public and private sector. Submissions have just closed on the Commission’s issues paper, and their draft report is due in early November. While there are legitimate privacy concerns about how detailed profiles of individuals are built and used, there is also a need for efficient data management to ensure it provides the maximum benefit in the face of major technological change. Developments in data management will allow both governments and the superannuation industry the ability to reshape markets, and create community and commercial opportunity. Little public access to administrative data. Missed potential for stronger evidence-based policy. 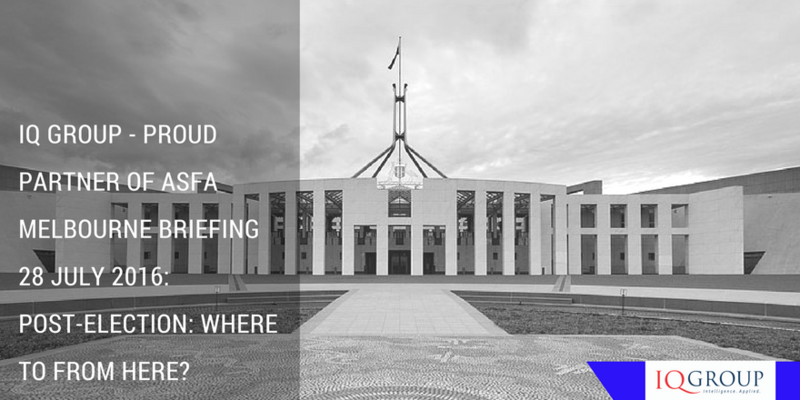 Despite the introduction of SuperStream and the major expansion of APRA data reporting, there remain very different approaches to data management by different government agencies. These may be the consequence of regulatory obstacles, under-resourcing and lack of a whole-of-government approach, but they result in significant additional costs to super funds, and ultimately consumers. The ATO is heading in the right direction with the MiX project that will result in the consolidation of Member Contribution Statements, lost and unclaimed super reporting and some other reporting, and which has the aspiration of real-time-reporting. Not only will this mean that consumers have access to more accurate and up to date information, it will also mean that super funds will be able to engage with the ATO in a more efficient way. I also hope APRA will be able to jump start their Data Dissemination Tool project with the help of the additional $10 million they were given in the 2016 Federal Budget. The DDT was to have been the tool that consumers and researchers could use to visualise and compare superannuation data. This project appears to have been stalled for a couple of years, even though it was an important part of the Stronger Super package of reforms. The Government response to the Commission’s data inquiry will help shape the way in which organisations can and should use data, and will help shape the competitive environment. At a high level, increased availability of data promotes efficiency, empowerment of consumers, competition, innovation and accountability. At a super fund level, it promotes improved member engagement and superannuation literacy, increased levels of member activity (eg, advice, investment choice, account consolidation) and gives funds the ability to better tailor their service offerings. Better use of data therefore transcends the interests of us geeks, and becomes an issue of key strategic importance for super funds. Funds that capitalise on this at an early stage, at integrate data management into the achievement of their strategic objectives are going to be the winners as the industry prepares for an environment of increased competition. IQ Group continued its long held association with ASFA by partnering with ASFA and presenting the Melbourne Briefing “Post Election – Where to from here” for an interested audience. The guest speakers were Kerry Chikarovski and Nick Sherry, and these well spoken former politicians on either side of the political divide, delivered a simple message …we need considered leadership and superannuation policies that provide reforms to meet the challenges of the Intergenerational Report. Kerry talked politics, here and abroad. Brexit and the American Presidential race all have common themes…a disconnection with mainstream politics and an electorate deeply suspicious of politicians. This played out in our last two Federal elections here in Australia, with a broad crossbench to engage and manage. This time around though, the crossbench might be less troublesome for Malcolm Turnbull, with the numbers tipped to favour the government amidst some minor horse trading on policy. The backbench however is a different story…challenging might be the appropriate word here. From my perspective, I think Malcolm will pay a little more attention to the “backbench meter” with a view to “win over” rather than alter policy. Moving on to Nick’s address, the pressures facing superannuation reform are longevity and birth rate decline. In short, an ever increasing number in retirement age versus declining numbers in workforce age to provide support. How do we fund a 25-30+ year retirement? It’s a puzzle to solve. However when confronted with an issue, you invariably go back to the beginning and for our industry, superannuation was introduced to supplement the pension, not to replace it. As much as we’d all like our superannuation to support us through retirement, we know that the pension is not going to go away…there will always be a percentage of the population who will rely on the pension. As far as superannuation reform goes, the topic of tax concessions featured prominently. The tax break between high income earners compared to the middle class is vastly disproportionate. A reduction of the tax concession for high income earners, coupled with a recommendation to increase the age of access to transition to retirement would all help improve the bottom line and provide fairness in the system. What was really great to see between Nick and Kerry was a respectful approach to the discussion even though on certain topics, there are differing views. It comes back to that comment on considered leadership, and it’s a stand out quality that will help drive the common good for our nation and one that could benefit other world stages, say for example the current American Presidential race. On another note, as a partner for the event the IQ Group held a lucky draw to win an iPad and congratulations to Michelle Westaway, FSS Trustee Corporation on the win…we hope the iPad comes in handy for you throughout the year.